Recently WISER conducted a trauma training scenario in the trauma bay in UPMC Presbyterian Hospital�s Emergency Department. 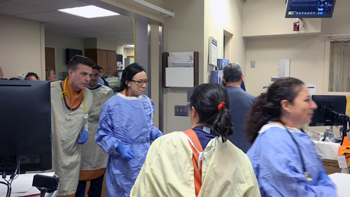 The course Director, Graciela Bauza, MD, Assistant Professor of Surgery and Critical Care Medicine, and Trauma Attending Physician facilitated this valuable interdisciplinary simulation. The participants included Residents, Nurses, Respiratory Therapists, Radiologic Technologists, Paramedics and EMT. The program focused on all aspects of caring for the trauma patient from the initial EMS hand-off, through the resuscitative efforts of the team.